Place your adverts here for free.! This page is being updated almost weekly. Items will be left on for a time, maybe for up to a year, but if we do not hear from you they will be weeded out, but you can always put them back on! Please ensure you give a full (and honest) description of what you are selling. Please include price, location (roughly)i.e. Cumbria, N. America, Wales etc!and a means to contact you. We need your e-mail address or a telephone number. You can write 'at' instead of '@' if you are cagey about your mail address being on here... (With a good anti spam on your P.C. it does stop most of the garbage!) We will mark the adverts with a month year code and review them after several months. Those with a '?' beside them are ones we have not heard from the sellers, and they may be out of date. CAUTION. Sellers should be aware they should not part with goods until cheques or money orders have been cleared and should not enter into agreements to 'ship', prior to being paid, as a precaution against the fraudulent! Click here to learn more about the sort of frauds tried! You will notice a number of items donated to fund the Web Site. Many thanks to those people. If you sell something from here, a small donation would be appreciated to keep these pages open for you. For these pages to work properly you must inform the us if you sell something. We will then mark the item "SOLD" and/or remove it from the site. New burgees now available,see Burgee page for details. We strongly advise any prospective purchaser to employ the services of a surveyor, further more we will remove any boats from our listing that are not scrupulously honestly advertised. Any boat advertised as 'ready to sail' must be in top condition. Failure to be 100% in any advert, and it will be withdrawn. We have recently heard of a very distressing tale and never wish this to be repeated. For Sale, or rent Wrecked Senior on trailer, good for shifting from person to person so you could pretend you were a real 'owner' contact eoa for your chance to have it in your backyard and get your name in lights! John, I have a brand new 2" No.8 Bronze, Flat Head screw from an Eventide - does this constitute ownership? Sorry Folks, yes it is a joke, this is what the ex owners in the old eoa actually resorted to to stay in charge! Sad Eh! Maybe by placing this here we can shame them into either restoring them or passing them to someone who is willing to! 1980, 10.3m Steel Hull, deck & superstructure. Long keel with bilge plates. Ali’ mast, s/s rigging. Main sail, Genoa & Storm jib. 3 cylinder, 35hp Lister (low hours). New electric anchor winch, 12mm chain, 20 Kg Danforth anchor. 7 new 12v batteries, transformer. Two fuel tanks (80L + 25L). 60 L freshwater tank. Taylors diesel heater/stove. 80% prepared & finished for safe long term/long range ocean cruising. Lying La Manga, Spain. €42,000 (or €48,000 finished). 27 ft Eventide for sale. 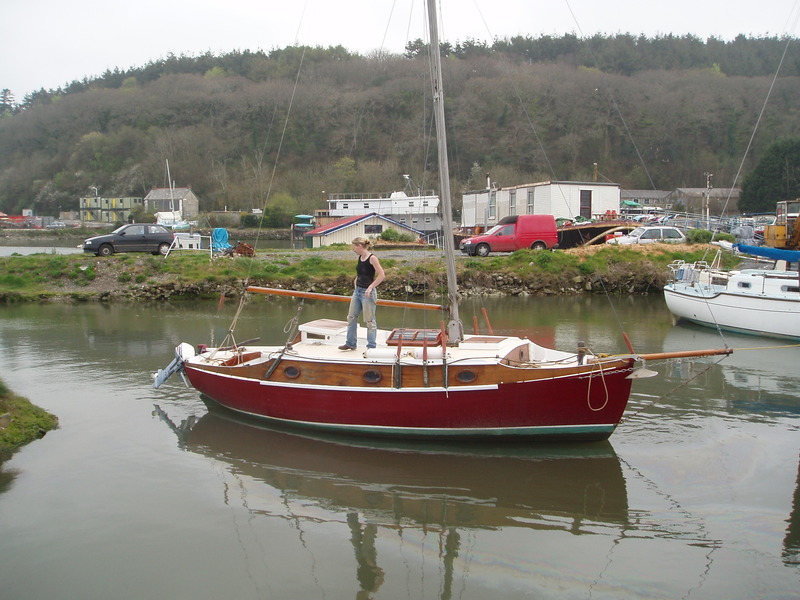 She is at present out of the water at Vellator, Braunton, North Devon on the river Caen, which is very close to Taw Torridge Estuary. The yacht Marian is 27 ft long, built above spec has a fresh set of sails including a stay sail. She belongs to a friend of mine Micheal Shaddick of Barnstaple He has not got E mail. That is why I am sending you this note. His mobile No. is 07813254737. WANTED, New owner for Coronette - Maurice Griffiths 1953 Mahogany on Oak Carvel Planked Canoe Stern Centreboard Bermudian Cutter. Just back from 4+ month cruise to St.Kilda, currently parked up in Millbrook, Cornwall - awaiting a few minor repairs / caulking / painting - inside and out. Pretty sturdy pretty boat that will get you anywhere, she'll make someone a lovely well admired vessel to be proud of. 10M Length 2.5M Beam 1.2M Draught (Centreboard up) 3/4 Berth GPS 128 ST60 Repeater Navtex DSC VHFCD Player New Sails - Main / Staysail / Jib (roller reefing) /Storm Jib / Cruising Chute New Engine Beta 20Hp 3cylPurpose built ply. dinghy Taylor's 030 Paraffin Stove Whole boat has been renovated throughout. I am looking for a new project to get my teeth into and don't really want to sell but if the right enthusiast is interested, she will have to go for £27,250. Failing that, I will sail her again next year. They don't build them like this any more. Based in the West Country, click link below. For sale and may be seen at Aldeburgh, Suffolk. She is in good condition and is ready for fitting out for 2007. She has 3 berths with new bunk cushions. There are 2 sets of sails. Stainless steel rigging. The engine is an inboard Stuart Turner with a dyna start. The hull is Inter-sprayed red. We sailed her to Belgium Holland and France many times in the past. GH 31'Cricket'from Brian in Malta. in good condition with new road trailer, sail number 61867. I have spinnaker sail but no boom or launching chute, the mast is alloy. Fortuna is a 22ft Maurice Griffiths Bawley Class. Mahogany on Oak. She has an 8hp Yanmar Inboard plus an auxiliary outboard. She has been recently restored by a shipwright. New standing rigging in 2006. 3 births and a sea head. She is on a mooring in Helford river (Cornwall) this summer. She is a very spacious little classic boat. Thankyou, I really hope that she goes to a good home as she is such a pretty little boat and we are keen for her to continue sailing. GAFF Ketch : 1933 Designed: by Maurice Griffiths and built by Everson in Woodbridge. LOA:34'6" - LWL: 29' 6" - BEAM: 9' 6" - DRAFT: 4' 3"
THE BOAT IS IN FRANCE at Canet en Rousillion. 25 ft long, 4 berth, mahogany on oak hull, laid decks. 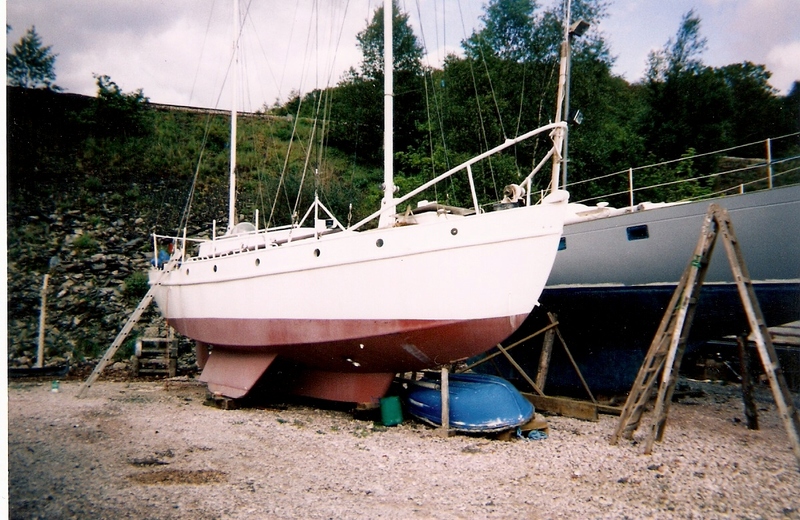 Owned by me for 10 years, I spent a lot of time and money on restoration, mainly rebuilding cockpit area, 6 strakes of planking to the topsides and replacing the transom, which had suffered from fresh water damage, after being left on a beach berth uncovered for some years. This work carried out by a shipwright, and at the time the cockpit was enlarged. First trip was to Douarnenez for the Festival, and was used for local sailing for a few years. Later the c/b was giving trouble and I removed it and replaced the inner keel and some of the metal floors..
Retirement, a long period out of the country and other things taking up my time means the boat has been neglected and needs some TLC. Mast sails and rigging are currently off the boat and in store, tan main, a jib I had made and has had very little use, and some odd sails I used to experiment with cutter rig. Engine is a Stuart Sole diesel 10 hp. was working fine when laid up. Full details and lots of photos of the rebuild and finished boat available, not digital I’m afraid ! Work needed is more DIY and cosmetic than needing boatbuilding skills. Golden Hind 31 number 148 built Terry Erskine 1975 owned since 1988. 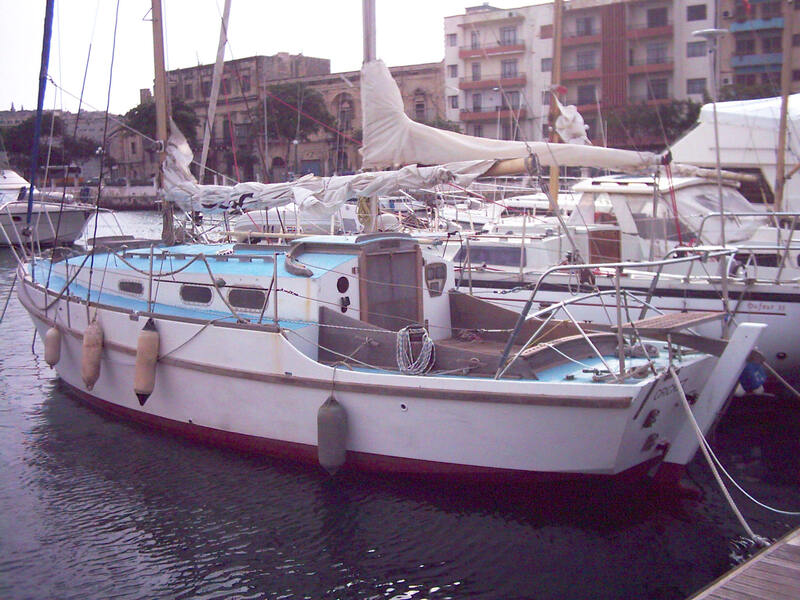 She is dry and clean and since 2003 moored in Italy. (Monfalcone, near Trieste.) laid up ashore. 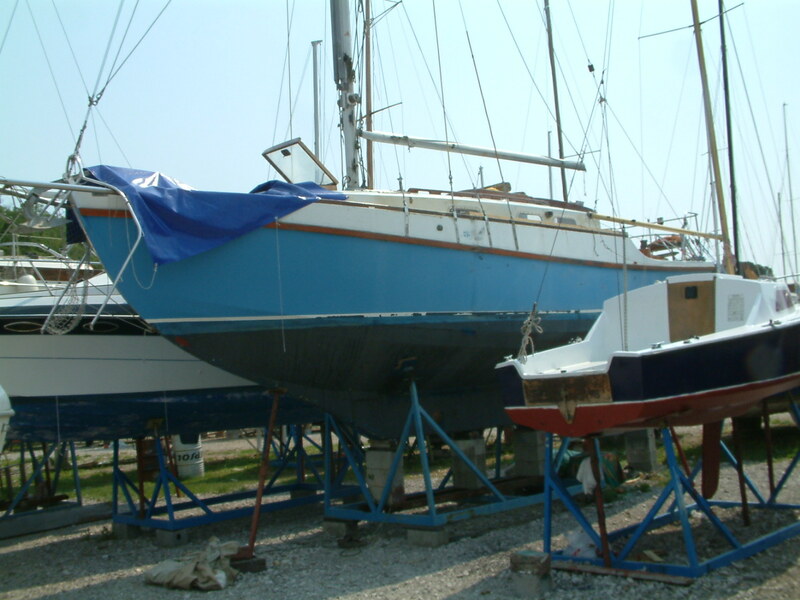 She needs her antifouling renewed, and a new coat of paint above the waterline. The Eventide 24 ' Blue Dancer is available to anyone willing to take on the finishing of the project. she is ply and the hull is in fair condition. Built in 1962, she may have the early lighter keel still, but anyone taking on this project would probably be sensible enough to want to remove the keel and bolts anyway, so adding weight and depth would not be a big problem. She still has paint on her.... No inboard, used to have an outboard in a well, (not to be recommended!) since removed. Needs bracket on stern maybe... or full conversion to inboard? Sails and rigging available. Mast and boom freshly varnished, new bowsprit made. donation wanted only...to local sailing club. Ashore at Hoylake in the Wirral Cheshire. Sail number 187, GRP Hull, built Terry Erskine, launched 1983. 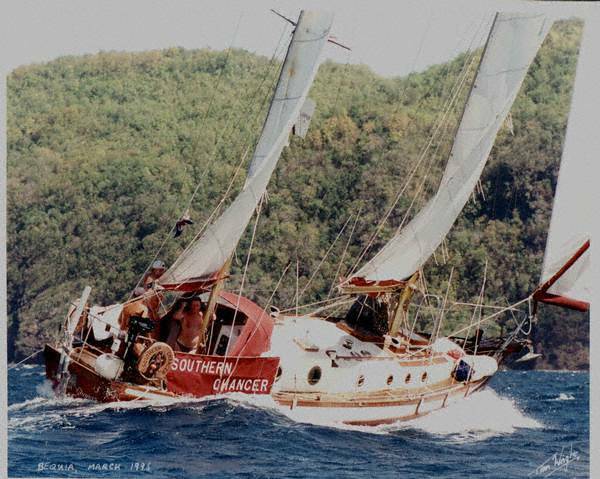 This vessel competed in the 1989 ARC, crossing the Atlantic. She spent 2 years in the Caribbean, before returning to the UK and being sold. For years she did not stray far, but was purchased some years ago by the present owner who totally refurbished her and made her back into a seagoing cruiser. She has been epoxy coated beneath the water line, still guaranteed for 3 years. Taylors cabin heater, Simrad Autohelm, Clipper echo sounder, Windex, VHF ariel, Taylors diesel/paraffin cooker, Rutland wind generator, spray dodgers, cabin lights, 3 new batteries, 240 ring main, auto bilge pump, Jabsco sea toilet. Sold with 2 suits of sails, an Airies Wind pilot and full Part I Registration. 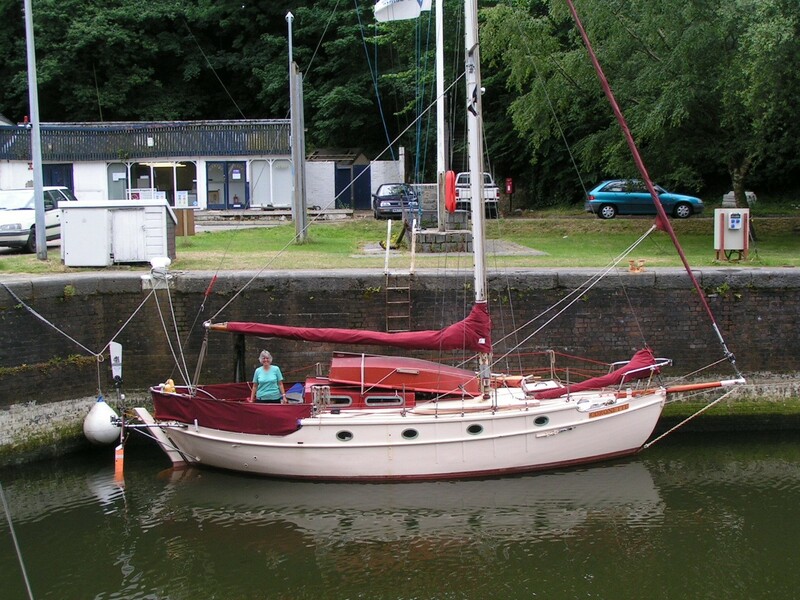 Boat at present in Belgium, owner living aboard, but due to return to UK soon. Built of Corton steel by Kesteloo in Holland. The original ply coachroof and cockpit have recently been replaced in steel. The cockpit was re-designed to make her much safer sailing short-handed. The yacht is bilge keel making her a very versatile vessel having the ability for Blue Water cruising and venturing through canals of Europe is very suitable for a drying mooring. The yacht has been cruised widely in the Mediterranean for several years. The accommodation comprises a fore cabin with double berth and a main saloon with one double and one single berth. She is fitted with Perkins 4108 engine, which was re-conditioned by a previous owner about 10 years ago and has few running hours since. The engine has keel cooling making her ideal for shallow waters and canals. A re-conditioned Hurth gearbox has been installed. The engine temperature and oil pressure gauges need fitting. The theme of the interior is classic in style with a number of antique (c. 1920) opening brass portholes having been fitted to the new coachroof sides. An astrodome is fitted to the companionway hatch which provides good all round visibility. The hull and superstructure is rust free and very sound. It would be difficult to find another vessel having steel in such a good condition. The exterior of the hull has been completely re-painted with two pack Jotun Hard Top. All new steel has been painted with Jotun Jotumastic primer and 6 coats of Jotun Hard Top. The coachroof, decks and hull above waterline are fully insulated making her a warm boat in winter and cool during summer. A Taylors diesel heater is installed in the salon needing just one flue section and diesel supply to be fitted. Tankage is approximately 50 gal water and 50 gal diesel. The water tank has recently been painted with a potable water paint. A 50 metre length of 10mm calibrated galvanised chain is fitted with a 45 lb genuine CQR. A Danforth anchor is also aboard. A set of fenders, warps and sheets is provided. 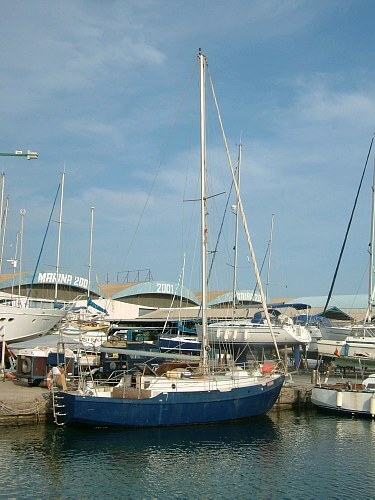 The yacht is sold complete with a new main mast and an assortment of sails. An Air-X wind generator is mounted on the mizzen. Although the yacht was extensively re-fitted several years ago there remains a small amount of work to complete. The yacht has full British Registry . The yacht is ashore on the River Dart in Devon. The asking price is £27,750. For Sale: GH 31 'North Star'. Golden Hind 31 'North Star' for sale. This boat was rebuilt by Golden Hind Marine in 2004-5. The boat was originally built in 1981 but had been laid up for 15 years after having spent only 5 seasons in the water. The hull and fiberglass cockpit were in near perfect condition and the builders fitted brand a new epoxy sheathed plywood deck. Last one out of Golden Hind Marine, it has been fitted out by an architect to a very high standard including an unusual interior layout with polished maple and white paint, Beta Marine 28hp fresh water cooled engine with Aquadrive unit, Taylors cooker, Hydrovane self steering, coal stove, shower, holding tank, forward facing chart table, Yeoman plotter, tan sails etc etc. Full details can be seen atwww.goldenhind31forsale.co.ukThe website includes a history of the boat, a full description and inventory together with previous owners stories and many photos and details. 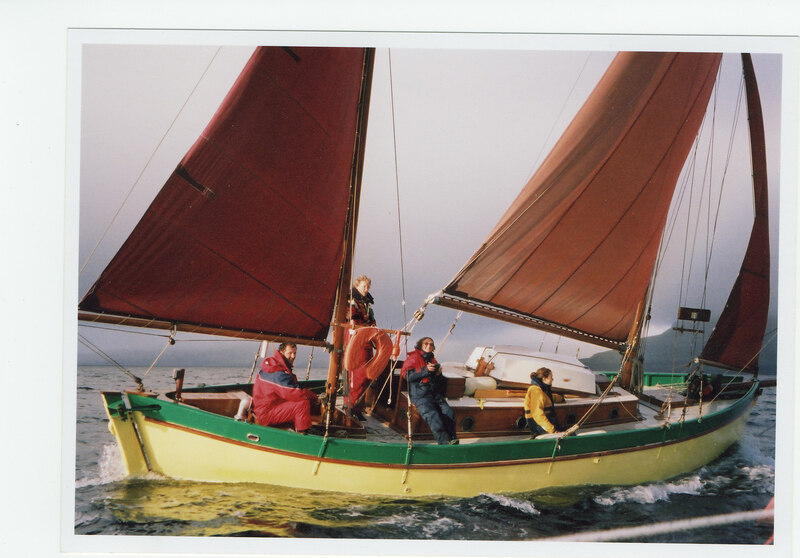 A typical East coast gaff riggedcutter designed by Maurice Griffiths. Built in North Wales in 1936. Pitch pine carvel planked on oak frames. She has been in her present ownership for 12 years, an active member of the Old Gaffers Association. He has kept her in very good order with a continual maintainence program. Keel bolts have been renewed this year. She carries a 8ft bowsprit. For Sale: Wild Duck‘Beautje’(steel) is for sale! She can be admired in the photo gallery on the website. She was built in Holland in 1962 and I have sailed her now for 7 years. Because my children are growing up and keep getting bigger, I have decided to start looking for a somewhat bigger boat. ‘Beautje’ is in absolute mint condition as I have taken care of her very well in the past seven years. A new teak-deck was put on in 2005, the engine has been completely restored (a Bukh DV 10, very reliable diesel inboard engine), new sails in 2001, a brand new all-weather cover 2008, paintwork and varnish every year and she has never been outside / in the water during winter. It's in one word a unique little boat with great sailing qualities that every body comments on in a positive way. Nothing comparable can be found, at least not in the Dutch waters! If you're interested, feel free to contact me by phone: 00-31-23-5298407 or by e-mail:schwartz at schwartzadvocaten.nl. Preferably with a roadworthy trailer. Engine not essential. Some work not objected to but would like a sound hull. Please send email with details if you have a Senior which is surplus to requirements. Price according to condition. For Sale:Bombard AX Mini (inflatable). Excellent condition. Oars, pump and thwart. £90. A one off design by MG for a friend. A description of a voyage by MG and friend from Oban to East Tarbert and back is contained in a chapter in his book "Little ships and shoal waters". I bought her in 2000, she was in surprisingly good condition, largely due to her having been in the ownership of one family for 42 years. Falmouth - The South coast and Scillies. She sails extremely well, hardly any wake, takes rough water and very rarely takes a wave aboard. She stands up well to her sails due more to her full hull shape than to her ballast, in all the perfect cruising boat, but for those wanting to race she still has a reasonable turn of speed. 35’ on deck with 8’ bowsprit; 31’10" waterline; 10’ beam, 4’10" draft. 3.5 tons iron ballast keel and internal lead ballast. Built by Harry King of Pin Mill in 1935 so you would expect her to be of the highest standard. 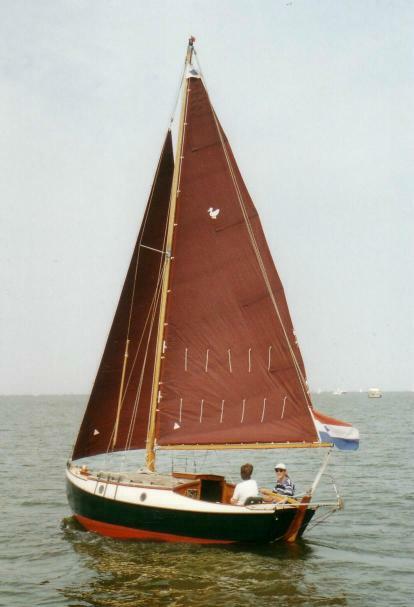 A double ender with long keel. Rudder hung on near vertical sternpost. Raised bulwarks, with a lot of open deck space on each side of cabin roof. Main mast stepped on a false floor, Mizzen mast stepped on cockpit floor. Slab reefing, though old roller reefing gear still in place and working on main. Deck of good pitch pine now sheathed in fibreglass. No leaks! Full length mostly pitch-pine planking, on sawn oak frames 2" x 1.5" at 8" centres. Galvanized rigging all new in 2008. New engine a 37.5 hp Beta installed 2004 – less than 1,000 hours on the clock – with new fuel tanks including a day tank. Capacity circa 130 litres. Good sized three bladed prop. Delightful unspoilt cabin with two berths and table, drawers and stowage under and behind berths. Fore cabin with berth and pipe-cot, chains in forepeak. Hanging space. Separate heads with Baby Blake. Galley aft with modern 2 burner gas stove with grill and oven, with ¼ berth opposite. Two piece tender sits on cabin top and converts into a easy to row skiff. Can also be sailed though sail needs some attention, being cut down by owner from an old dinghy sail. Small staysail, running chute, mizzen staysail, large lightweight jib / yankee, larger jib, flying jib (for those that want the extra sheets to handle! ); storm trysail. 'Neptunes Neried' Engineis a Kubota 28hp, £1,000 spent to refurbish a year ago, good runner, new battery, needing the on board 12v electrics and navigation gear, has not been to sea since refit. She has 240 mains. She is completely restored with Alloy mast and sails, including spinnaker. Mast need re-stepping, has all new rigging. New sail covers, cushions etc. Electric auto and manual bilge pumps, new heat exchanger and stern tube greaser. Vee berth forward, single berth in saloon, Sea toilet in separate heads to aft end of saloon. Only used as motor boat for past year. Sandwich, Kent.